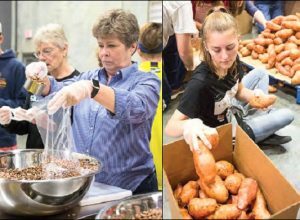 More than 300 volunteers turned out to sort, package and label food and load disaster recovery supplies during the 40th anniversary United Methodist Ingathering. The Nov. 18 event was held at the Arkansas Foodbank warehouse in Little Rock. In just four hours, volunteers of all ages and abilities packaged 14,000 pounds of pinto beans, boxed 30,000 pounds of sweet potatoes and loaded tons of flood buckets, kits and cleaning supplies. The food is earmarked for Arkansans supplies will be ready to help when a disaster strikes. Matthews Farm in Wynne donated the potatoes. The harvest and gleaning, made possible by the Arkansas Department of Corrections, was coordinated by the Society of Saint Andrew. The Arkansas Hunger Relief Alliance plays an instrumental role in bringing together these partnerships. “There are so many hands that are part of Ingathering,” Dassinger added. In addition to covering Ingathering expenses such as purchasing the beans, boxes and packing supplies, and covering staff overtime, the total of which comes to approximately $10,000, the Arkansas Conference made a $2,600 cash donation to the Arkansas Foodbank. At the end of the day, 17 United Methodist food pantries returned home with an abundance of items to stock their shelves. Also at Ingathering, local churches reported on the past year’s mission and service activities. According to the Conference Center for Administrative Services, of the churches that reported, more than 222,000 hours have focused on mission and service activities in the past year. You probably spend a lot of time trying to make sense of God. But, ultimately, God is mystery. The point of faith is not to figure out God by right thoughts, beliefs and actions. It’s to spend a lifetime – and ultimately eternity – exploring the heart of God, experiencing the unconditional love of God, being transformed by the power of God and consciously living every second in the presence of God. So jump into the divine mystery today; then embrace it, revel in it and make it the single most important reality in your life. Although you will do almost anything to avoid pain, it can actually be beneficial. Trainers know pain is a sign runners are getting ready to break through to the next level. Doctors look for pain to make a diagnosis. Therapists understand pain is an incubator for growth. While God does not inflict pain, God does enter into your pain, helps it to be a vehicle of grace, brings you healing and uses it to enable you become the person God has created you to be. So, how is God using pain in your life today? You probably have a ‘check-it-off’ list of things you want to do – sailing the Nile, seeing the Cubs play in Wrigley field or climbing Mt. Kilimanjaro. But do you have a ‘check-it-off’ list of who you want to become? If not, maybe it’s time to craft one that includes you becoming more dependent on grace, infinitely loving, increasingly generous, far more compassionate, eternally visionary and completely focused on the heart of God. You’ll be amazed at the places you go and the people you see when you focus on this ‘check-it-off’ list!